Destin is an amazing vacation spot, and it is a popular place for families who love the outdoors. While there are plenty of ways to soak up the sun and enjoy the beach while visiting Destin, it is hard to imagine a better day than chartering a pontoon boat and getting out on the water. 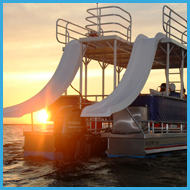 Explore just five of the many reasons families love pontoon boat charters in Destin, Florida.